Since external users are not able to interact with App Maker apps, you can create mechanisms that control how users share files in Google App Maker. Take a look at our sample file, in we which demonstrate how you can share soft and hard copies of important files and reports with unconnected users. Google App Maker is a great app development tool to help you streamline and improve the way you work. And, it’s also useful for storing the important data that help you get your work done. It’s an invaluable tool that allows you to log in from anywhere to view and edit your data. But sometimes you need a hard copy or at least a copy you can view offline. Who hasn’t printed an e-ticket for an event or a boarding pass for a business trip because it’s just easier to pull out a piece of paper than to find, launch and then log into an app on your phone, which you hope has enough power? So with that reality firmly clenched in our fists, we created a way to share hard and soft files in Google App Maker. In our previously released Event Management sample file, we created an app that tracked the logistics of coordinating and running events, specifically career fairs. The file hosts several modules – Events to capture event details, Vendors to aggregate information about venues, caterers, printers, etc., and People to store recruiting contacts and their activity. In an effort to enhance the functionality of our event management app, we added the ability to track sessions, which are essentially events within the career fair events. This led to the need to provide session schedules for vendors and attendees. However, vendors and attendees are external groups so they don’t have direct access to our Google App Maker solution. Google App Maker is strictly an internal tool and for this reason, users must have the same company domain in order to use the app. Hence, we had to come up with a way for users to share files with unconnected users in Google App Maker. And so we developed mechanisms for users to create editable, viewable, downloadable and/or printable files that they then can share with external groups. First, we created a new tab within the Event details page and named it Sessions. This allows us to create session records, which capture all the pertinent information like time, name and duration. At the top of the page, we placed buttons that allow the user to download the file, edit the file in Google Docs, view a printable version in a browser or email it as a PDF. Obviously, this part required a bit of coding to accomplish but don’t worry we’ve done all the heavy lifting for you and it’s included in the updated Event Management sample file. 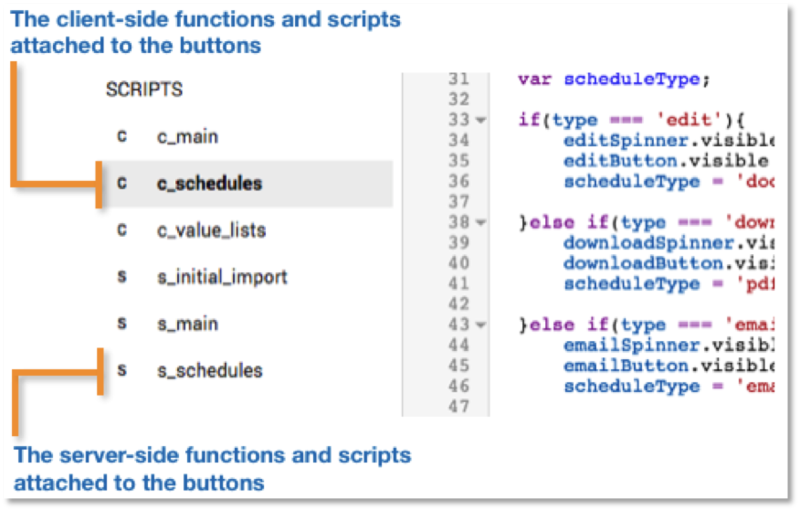 Take a look at each of the buttons and their associated scripted functions (c_schedules or s_schedules). You’ll see how we did it so you too can provide yourself and your unconnected users with hard and soft copies of important files or reports. These mechanisms offer a way for external users to indirectly interact with the information within your app. It certainly won’t work in cases where external users need direct access to the app; that just isn’t possible at this time. Stay tuned as we continue to explore and demonstrate what is possible with Google App Maker. Please note, in order to access the file, you will need Google App Maker – which is available to G Suite Business, Education and Enterprise users – and Google Cloud SQL. If you need help installing files in Google App Maker, you can follow our detailed install instructions or watch the demo.